Who should not take Cipro Suspension, Microcapsule Reconstituted? This medication may be taken with or without food as directed by your doctor, usually twice a day (every 12 hours) in the morning and evening. Shake the container well for 15 seconds before pouring each dose. Carefully measure the dose using a special measuring device/spoon. Do not use a household spoon because you may not get the correct dose. Do not chew the contents of the suspension. Do not use the suspension with feeding tubes because the suspension may clog the tube. What conditions does Cipro Suspension, Microcapsule Reconstituted treat? List Cipro Suspension, Microcapsule Reconstituted side effects by likelihood and severity. This medication contains sucrose and is therefore not recommended if you have a rare hereditary metabolic condition (such as fructose intolerance, sucrase-isomaltase deficiency, glucose-galactose malabsorption). What should I know regarding pregnancy, nursing and administering Cipro Suspension, Microcapsule Reconstituted to children or the elderly? Does Cipro Suspension, Microcapsule Reconstituted interact with other medications? 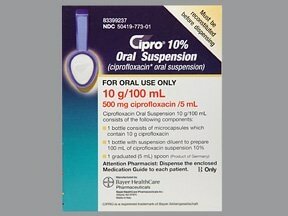 Should I avoid certain foods while taking Cipro Suspension, Microcapsule Reconstituted? Do not change brands of this medication without asking your doctor or pharmacist. Not all brands have the same effects. Before mixing, store the dry powder and mixing solution in an upright position at room temperature. Do not freeze. Once mixed, the suspension may be stored in an upright position in the refrigerator or at room temperature. Discard any unused suspension 14 days after mixing. Do not freeze. Do not store in the bathroom. Keep all medications away from children and pets. Discard any unused medicine after treatment is completed. Are you taking Cipro Suspension, Microcapsule Reconstituted? Are you considering switching to Cipro Suspension, Microcapsule Reconstituted? 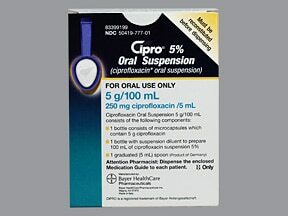 How long have you been taking Cipro Suspension, Microcapsule Reconstituted?